Here we have a few photos of some of our boats. We will be updating this soon with some better views. Top right is the 21' pontoon party barge. Middle is the 18' party barge. These are great if you have several people in your party as they will seat 12 people. Or maybe you just like lots of room to spread out, relax & take in the beautiful view all along the St. John's river. Very comfortable & stable boats for cruising the river, fishing & sight seeing. 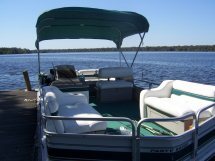 The pontoon boats have live wells, Ice chest, dry storage, attached BBQ grill, bimini top & all the safety equiptment is of course provided. Next to bottom right is a 18' Triton fishing boat. This boat is rated for up to 6 people but will comfortably seat 4. Center console w/ 60 hp motor. Great for fishing in deep water or in shallw areas. 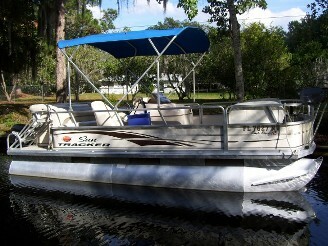 It has a live well, dry storage, rod holders, fish finder & all safety equiptment. At the bottom are the kayaks that are also available for rental. Please see the photo page for more & see the rates page for prices on pontoons, fishing boat or kayaks.